The difficult security incidents on Israel's northern border clouded Japanese Prime Minister Junichiro Koizumi trip of to Israel on Wednesday, but diplomatic officials were pleased with the visit, the first in a decade, and with its contribution to the tightening of relations between the two countries. During a press conference the two leaders held Wednesday evening, the disagreements between Olmert and Koizumi regarding Israel's response to the abduction of soldiers into Lebanon was apparent, but on other issues - such as the concern regarding the Iranian and North Korean nuclear programs and the building-up of terror, the two seem to see eye to eye. Koizumi said that the North Korean missile tests and the nuclear weapons the country possesses pose a threat to the international community. The Japanese leader said that he and Olmert have agreed that a unified front needs to be consolidated in order to send out a strong message against the nuclear development plans. PM Olmert, on his part, stated that Israel was concerned over the issue of a non-democratic country developing unconventional weapons. 'We wish to discuss what Israel can do as a member of the international community," Olmert added. In wake of reports from the northern front, Koizumi called on Israel to show restraint and take sensible measures in its fighting against Hizbullah, stating that an eye-for-an-eye approach will do no good here. Olmert politely rejected the Japanese PM's call and said that Israel's stance is clear and will involve hardships. 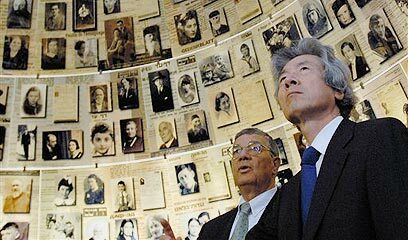 Koizumi also visited the Yad Vashem Holocaust memorial in Jerusalem, and told Ynet afterwards that he now understands Israel's need to fight for its existence. "I understand the sadness of the bereaved families and I understand the Israeli people's commitment for building their country and fulfilling a dream." The Japanese leader is set to meet with Palestinian President Mahmoud Abbas and announce in the meeting Japan's decision to grant aid to the Palestinians directly, and not through the international aid organizations. Japan insists that the money will not be funneled to the Hamas-led government, but that it go toward creating workplaces in the Palestinian Authority and renovating the president's office. Koizumi will also declare the initiation of a joint project uniting Japan, Israel, Jordan and the PA, in the framework of which an agricultural-technological park will be erected in the Jordan river area. An official at the Japanese PM's delegation told Ynet that Japan will demand of the Palestinians to act for the release of the Israeli hostages. See all talkbacks "Security incidents set tone for Japanese PM's visit "